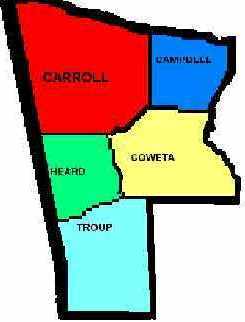 The 1830 U. S. Census for Carroll County Georgia was the first Census for Carroll County. It was enumerated by Benjamine Merrill on the 25th of November 1830. He shows a total population of 3419, including 1430 white males, 1293 white females, 244 male slaves, 244 females,111 free colored males, 27 free colored females. It appears that the free colored people counted were mostly Native Americans. This is unusual and provides some rare data about some of our first Americans. They were all listed on the last two pages of the record. I have indexed them in a separate table. The following tables were extracted from a microfilm copy of the original records by Wally Smith. The names are spelled as they appear on the microfilm as best I can determine. Some are obviously misspelled and some are just a guess because of less than perfect handwriting by the census taker. I have made every effort to provide an accurate transcription, but I am far from perfect and I can and do make mistakes. I don't advocate using this or any other data as your only source. But perhaps it will lend a clue to folks researching in this period. Always verify everything. If you find an error that I have made, please let me know. I hope to eventually add the rest of the data such as the number of people in the family etc. If any one wants to help with this let me know.